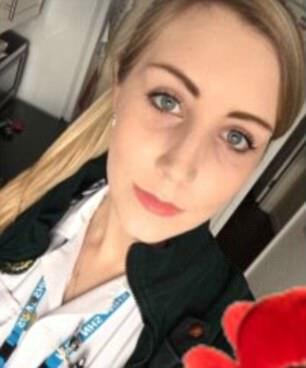 The manager of a rehabilitation centre where a man died despite the efforts of paramedics has blasted a resident who left a moaning note on an ambulance. The 42-year-old, who was 'vomiting blood', died after being rushed to hospital with 'massive internal bleeding'. The service said the ambulance was at the scene for no longer than 30 minutes. The patient had been at Livingstone House, a charity and rehabilitation centre for drug and alcohol addicts, for three months. Centre manager John Hagans said the man's family had been made to feel 'fifty times worse' after discovering the note had been left on the ambulance sent to help their son. He said: 'They are absolutely horrified. They said it's hard enough as it is, with the loss. 'The man's father said to me that it has just made it 50 times worse. The man had been clean for three months before he collapsed. 'He was making active changes to change his life. He was somebody who had made poor choices but was now making the right ones. 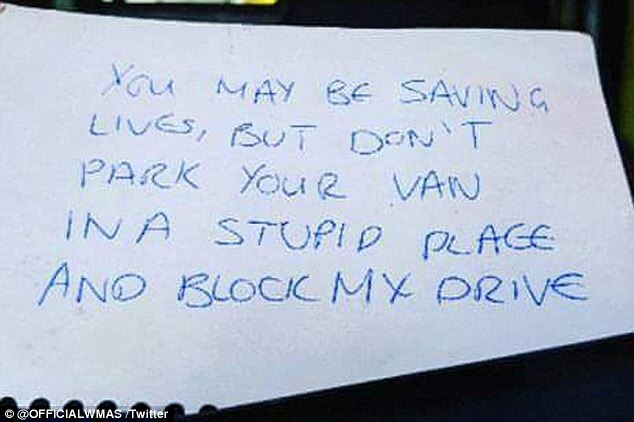 Paramedics battled to save a man while mean-spirited neighbours left this note moaning about the ambulance blocking their driveway - he later died in hospital. 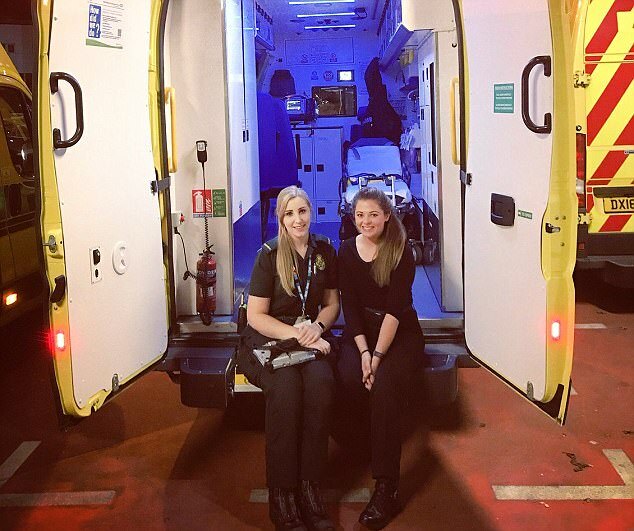 West Midlands paramedic Tasha Starkey sat with a colleague at the rear of an emambulance. Mr Hagan added: 'One of these days, heaven forbid that the man who left the note or his family might need an ambulance. He would shut down all of Small Heath to get an ambulance through. 'We do have a problem with parking but on this particular day, the ambulance was parked down an alley and wasn't blocking anywhere. 'Ultimately, what kind of individual would be so vitriolic towards an ambulance crew. Residents in the street say the note was written by a man who 'should know better'. When the woman was shown the note and asked if she recognised the handwriting, she slammed the door shut. A neighbour of the man, who did not want to be named, said: 'Everyone says it was this guy (who wrote the note). If it was then he should know better. John Hagans, a nurse consultant at the charity, said they were 'disgusted' by the note. He said: 'Words fail me. This person deserves to be shamed. If the person who wrote it had had any idea of what was going on inside, they would not have dared. 'The resident collapsed in the home and was vomiting blood and our nurses and the ambulance crew battled extremely hard to save him. 'His condition was so severe they could not move the ambulance for half an hour because they were fighting so hard to save him. 'In that situation no ambulance crew should have to worry about annoying others because of parking. It's ridiculous. 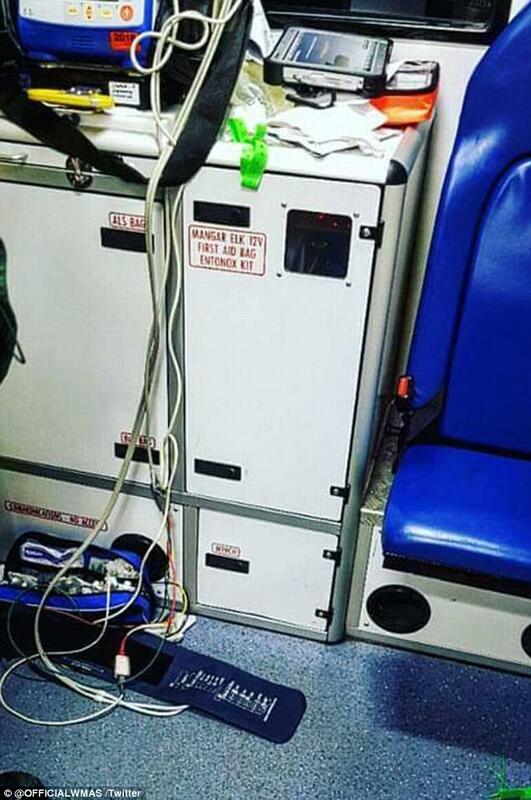 'One of our staff members who was trying to help them spotted the note when they brought him to the ambulance. We were left completely stunned. 'What's worse is that another driver was trapped on an alleyway that runs down the back of our property for over 40 minutes. The patient passed away at Heartlands Hospital on Friday evening. 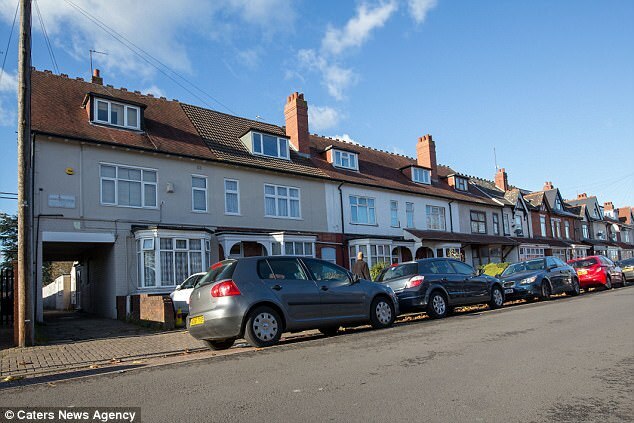 Several residents on the street in the Small Heath area of Birmingham expressed their disgust at the note. Anamaria Dunne said: 'I did not see the ambulance come but my husband did. He said there was nowhere else it could go. 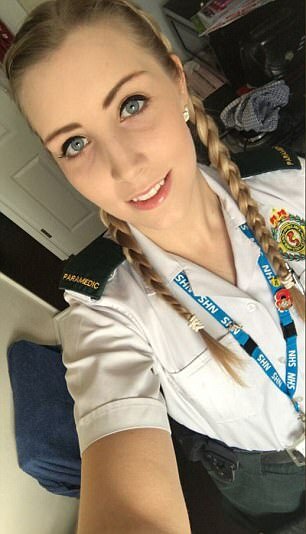 'It's not nice that they left the note when the ambulance crew is trying to save someone's life. Another neighbour, who did not wish to be named, said: 'It's a ridiculous situation here. You see arguments in the streets about it sometimes. 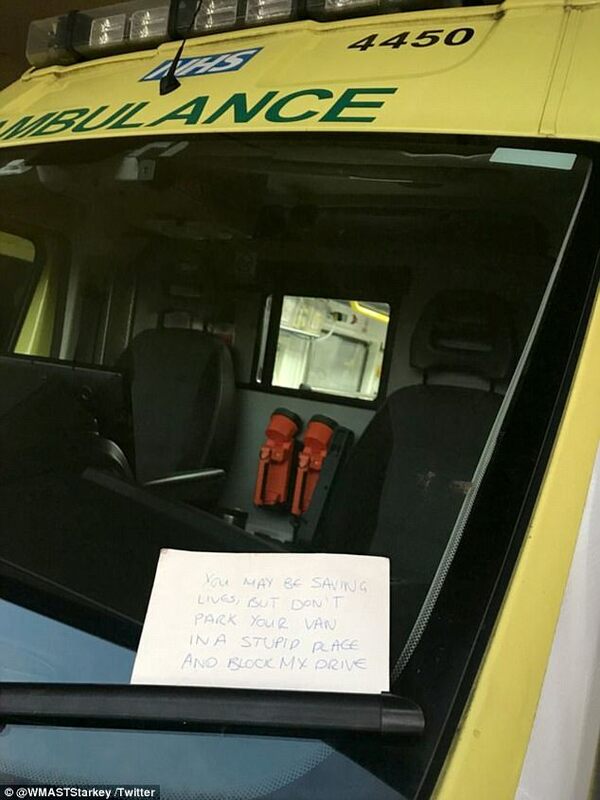 'In a way I'm not surprised someone left an angry note, even though it is shocking to do it to an ambulance. Paramedic Clinical Team Mentor Sam Grimson wrote: 'One of our crews encountered this delightful note after assisting a patient suffering a major internal bleed! The crew were not on scene long due to how poorly the patient was. 'We always try to park appropriately but sometimes it is not possible. 'West Midlands Ambulance Service tweeted: 'Sometimes we just don't know what to say. This was the note left on an ambulance today. At the time, the crew were helping a man who was extremely unwell after vomiting blood. In a second separate incident over the weekend, the service was targeted by another angry resident understood to be complaining about an ambulance being parked in a place that prevented their car from moving. West Midlands Police also tweeted that a marked police vehicle had been damaged at a Remembrance Sunday event and its windscreen smashed..